You might think from the lack of blog posts this summer that there hasn't been much golf on my docket. That couldn't be further from the truth. As a matter of fact, 2010 has been one of my best ever in terms of rounds played and quality courses played. Heck, I even got a semblance of my old golf game back. Here's a recap of a great summer of golf, in a series of installments (keep coming back here as I'll simply add to this post). During the harsh winters of Chicago, months away from the game will start doing funny things to your brain. Really the only thing that gets Jefe, Jimbo and I through to the other side is e-mail banter about golf, and most importantly, planning the next year's golf trip. By the time January rolls around, however, all sound decision making is officially out the window. Usually this leads to crazy statements like, "I really want to play JIm Engh's True North. It looks great!" or "I've officially peaked as a lefty...I think I'm going to switch around and start playing righty next year." With that as a backdrop, last winter saw one of our craziest decisions yet. 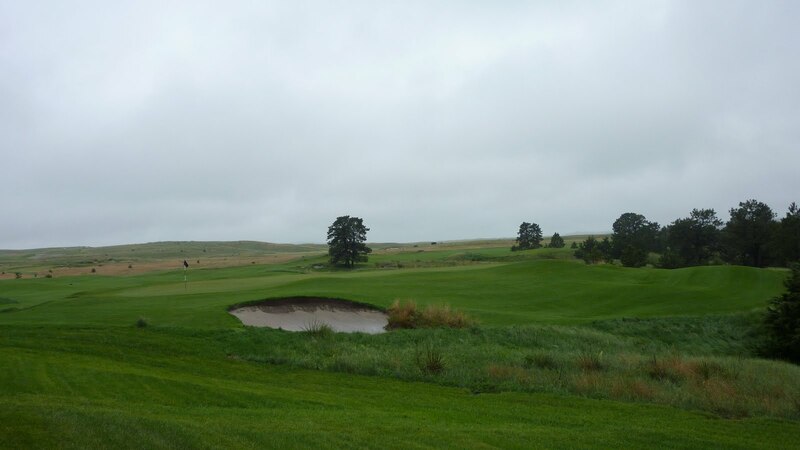 We decided to road trip it out to Nebraska and Colorado in June to play Ballyneal and the 36 holes out to Prairie Club. Given that Prairie Club is 6+ hours from the Denver airport and is sort of on the way back to Chicago from Holyoke (a misnomer...as Valentine, NE is not on the way back to anywhere), driving started to make logical sense. You could at least make a case for it. I romanticized the hours of quality windshield time spent with my two closest golfing brethren talking about golf, fond memories (redundant) and the meaning of life (ditto). I set up a mix on ITunes months in advance, targeting songs fit for a long road trip ("Thunder Road", "One Headlight", etc.) It was going to be a trip of a lifetime. 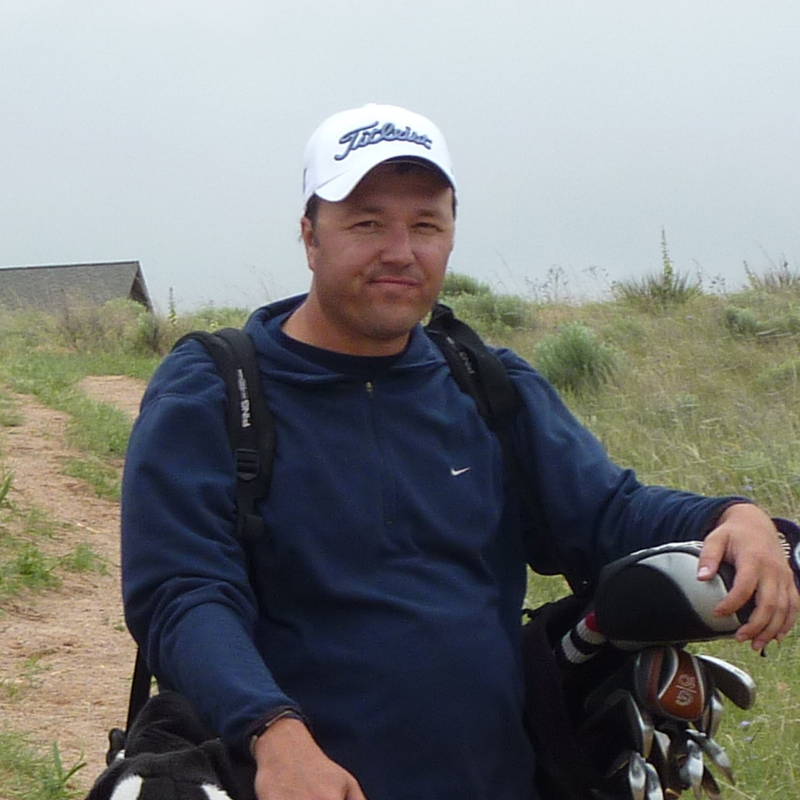 The original plan was to leave around 3:30 A.M. on Friday morning for a late-afternoon arrival at Ballyneal and time for a quick 18. But as the dark, dreary days of winter wore on, my need for a golf trumped any thoughts of camaraderie. I needed to max out on the golf. When it comes to golf and golf trips, I'm a "Cost per round" guy. I can't help it. Our numerator was essentially fixed. But the CPR could be lowered by raising the denominator (I think I just lost Jefe. Bear with me, big guy). And the solution to our (my) problem was to just leave the Thursday evening and drive through the night. An early morning arrival at Ballyneal meant squeezing an extra 18 or even 27 holes out of the trip. After picking up Jimbo, I rolled up to Jefe's house in the far, far west suburbs to officially launch our trip. He was waiting at the end of his driveway with his packed bags at his feet. He was holding up a piece of paper with 'Ballyneal or Bust' scribbled on it. Great minds think alike, as I had already taped a makeshift 'Ballynizzle of Bust' sign on the back windshield of my Jeep. A couple of farewell hugs and kisses and we were on our way. Nothing erases the feeling between me and you…ohh! I had a driving rotation planned out to help us get through the night alive. Each man would spend four hours driving, four hours playing wing man and four hours sprawled out in the back seat sleeping. But that plann backfired as apparently Jimbo didn't get the memo. He slept like a baby in the navigator's seat as Jefe drove, forcing me to stay awake in the back to keep Jefe awake. Not that Jefe needed me, as he was flying high from a near-lethal combination of Mountain Dew, 5-Hour Energy, No-Doze and energy bars. One can of Jolt would've certainly sent him into cardiac arrest. After his turn behind the wheel, he admitted, "I can't sleep right now. I'm on six different kinds of stimulants." I took the anchor stretch and we rolled into Holyoke just as the sun was rising over the Chop Hills. After 12 1/2 hours and 850 miles of relatively smooth sailing, I almost flipped the car on the dirt road about 5 minutes from the gate trying to locate my sunglasses. But we made it to the glorious gates of Ballyneal around 6:00 in the morning, just as the maintenance crew and staff were rolling in. We were thrilled to be there, but more relieved than anything. I think we slept a total of about 3 1/2 hours total between the three of us, 3 hours and 20 minutes of that from Jimbo. That first round was a blur. Playing golf on 10 minutes of sleep was quite an adventure. I have no idea what I shot but I know it wasn't good. But hey, that Cost Per Round was moved down a notch, so (I guess) it was worth it. After the round, we met up with some of the others in the group that had just arrived. After a quick lunch, we got up from the table as I said, "Excuse us, gentleman. We're going to go take a nap." 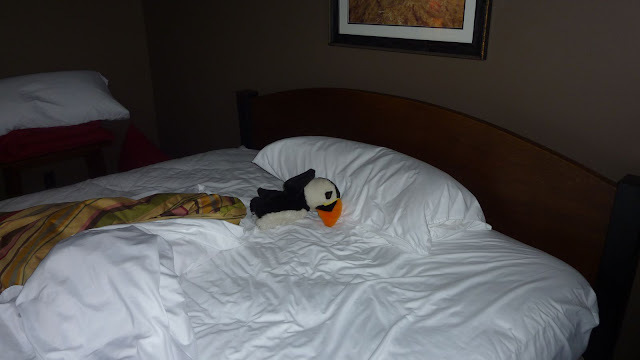 So with that, we retired to our room in the Ringneck Lodge, drew the shades and hit the beds like a sack of potatoes. I took solace that my 2-year old son was probably doing that exact same thing at that moment, except he wasn't sharing his bed with his best friend ("either these beds are getting narrower or we are getting wider," I commented to Jefe). As I drifted off, I remembered that I needed to text my buddy Matt (a.k.a. The Package, at least until I can come up with a better nickname so I don't have to keep typing The Package over and over again) to see what time he was rolling in, since we had planned to tee it up together that afternoon. I was expecting him to arrive around 3:00 p.m., which would give us a good two hours of 'quiet time'. Matt: I'm near the pro shop. Where are u? A few moments later, I heard a knock at the door. Matt entered the room to find three grown men in a room with two beds taking a mid-afternoon siesta. Best yet, it was the first time he was meeting Jefe. I'm sure it left a great first impression. We set-up a time to meet on the first tee in an hour, giving us 59 precious minutes of glorious, much needed rest. Out of all of crazy trips together, this was a definite first. Although I can guarantee you that if we had all shot in the 70's that afternoon, a mid-afternoon catnap would've made it way into the normal golf-trip M.O. Friday afternoon's round saw a remarkably novel concept…Jefe and I as teammates! After years upon years spent trying to beat each others brains in, we paired up in what turned out to be an epic fourball match against The Package and Jimbo. Actually, the concept isn't quite as foreign as it sounds. We did pair up once before, but it was 13 years ago. And we had success while on the same side, blitzing the field in the (not so) vaunted 1997 Sycamore Cup, a Ryder-Cup style two-day event at (not-at-all) historic Sycamore Country Club about 50 miles west of Chicago. Perhaps all this time the world has missed out on another Ballesteros/Olazabal simply because all Jose Maria wanted to do was beat Seve to a bloody pulp. [Oddly, one of my other crowning athletic achievements was also at Sycamore Country Club. I placed 6th in the Little Seven Conference golf tournament my senior year in high school, earning all-conference honors and eventually team MVP. 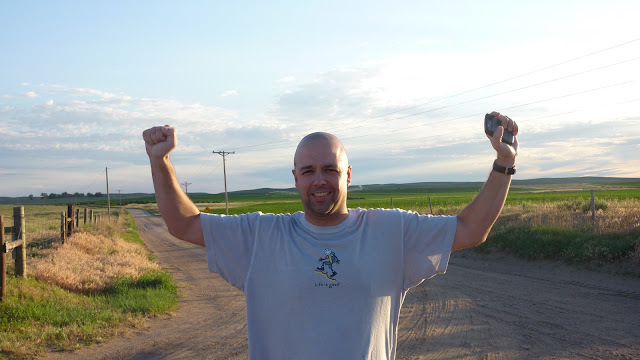 Over the summer, Jimbo asked us to list all of our life's crowning athletic achievements. The answers are equal parts interesting and depressing. - I've got some bling, including a fake gold medal from an 8th grade boys basketball tournament that my squad won. We went 15-5 that year and I led the team in scoring, all while wearing socks up to my knees and the tightest hot pants this side of Wonder Woman. - I also have a trophy for the highest average during my 6th grade intramural bowling league. - Various track and field ribbons from 1st - 5th grade track and field days, including a blue ribbon in the 400 yard race. - My tee ball, minor league, and major league little league baseball teams all won the championship. I received a trophy for the major league title. - I won a plaque for a basketball shooting contest in fifth grade. - Believe it or not I won the long jump in the 16 team Wolhutter Invitational in 8th grade with a jump of 17' 6.5" and I have a trophy for that. This is the peak of my athletic accomplishments. - I received a ribbon for finishing in fourth place as a freshman in the JV Upstate Eight Golf Conference Tournament (39-44 83). - Coltrain and I won the coveted Sycamore Cup, a two man team event, and we each still have the cup. - I won the C Flight in the St. Charles Park District match play tourney and have a trophy for that. - And, of course, I am the proud captain of the winning side of the inaugural Ballyizzle Cup, and I take it with me in a little felt case everywhere I go. Back to the match...Colton/Jefe versus Jimbo/Matt turned out to be the perfect match-up. Schulte carried the lowest index, but he can be so night-and-day that his golf buddies call him Othello. Jefe maybe has Jimbo's number by a stroke or two. I was the X-factor. Any one of us could birdie one hole and triple bogey the next. And that's exactly how Saturday afternoon's match played out. Very few holes were halved and it bounced back and forth, neither team getting more than one-or two-up on either side. You couldn't have drawn up a more even pairing on paper, unless the match was scored on chest bumps, trash talk and posturing, in which case Jefe and I would've 10&8'd like Tom Doak on any TPC. The pinnacle (or nadir) came on the 16th tee. Coming off a Jefe birdie on the 15th that squared the match, I bombed a drive down the left side of the reachable par 5. As soon as the ball was in the air, I untucked my shirt and stomped around like one of those guys in a Re-Max long-drive contest, much to the dismay of Jimbo. A birdie there put us one-up, a lead we carried to the last hole. Jimbo got the last laugh, however, as I was unable to get up-and-down from the front of the 18th green and the match ended all-square. Although I was probably the last person Jimbo ever wanted to play golf with again, it was decided the match would have to go USGA...only another 18 holes the next day could crown the rightful winner. To give everyone some much needed breathing room, I played with Shane and his buddies the following morning. It was a great time, but honestly I wish I was never part of their group. You see, Shane and his three college buddies, Steve, Tyler and Mark traveled and golfed together all over the globe much like Jefe, Jimbo and I and so many other tight-knit golf crews out there. They even had a cool name for themselves: The Four Gorsemen. I kicked myself for not thinking of it first, but it would've been moot since we can't seem to keep a fourth for more than a couple rounds. Shane and the other Gorsemen had the opposite problem. Their rock-solid four was tragically cut down to three, as Gorsemen Mark, like Shane a former professional ballplayer, stud golfer and from what I can gather an all-around great guy, collapsed and died at the age of 32 right after completing a half-marathon back in March. This was the first golf trip other three had been on together since his death. Obviously it was extremely emotional for them. On Friday morning, they left a ball on the first tee for their fallen brother. As somebody who has tried to capture the bond between guys and their lifelong golf comrades, I felt their pain. I couldn't help but imagine what it'd be like to lose a Jefe or Jimbo and to never be able to experience the thrill of teeing it up on some far-flung, all-world golf course together. I don't know what I'd do with myself. The tears were shed by the now-Three Gorsemen on Friday morning. The scars were still there on Saturday, but it was back to doing what they did best - busting each others chops and making the most of their precious time together. I felt honored to be along for the ride. "It feels good to have a lefty in the group again," Tyler said in a nod to Mark as we walked off the first tee, exactly the first time anyone has ever said that to me. By the third hole, I felt like an honorary Gorsemen. As the round wore on, it was easy to see the parallels to their group and ours. Gorsemen Steve played the Jimbo role as the token punching bag, making himself an easy target by wearing a NorthFace jacket so impossibly small that the only logical explanation I could come up with was that it had been borrowed from his 11-year old nephew. Like any good golf partners, Shane and Tyler ribbed him about it incessantly. I'm sure Mark would've been proud. On Saturday afternoon, it was time to continue the fourball match. Jimbo, perhaps motivated by the gamesmanship from the previous afternoon, came out of the gates scorching and staked an early lead for him and Matt. He looked like a shorter-hitting version of Zach Johnson, splitting fairways and getting up and down anytime he had wedge in his hands. When Jimbo's doing that, he's tough to beat. We originally expected another back-and-forth event, but Jimbo and Matt took control of the match and Jefe and I found ourselves an unprecedented 3-down with 5 holes to play. It was now or never for us. Fortunately, Jefe and I channeled some of that 1997 magic. I finally contributed to the team with a birdie on #14 to get it to 2-down. Jefe stuffed it in tight on the 15th and birdied it again and suddenly we were down only one. After I made par to halve on the 16th (Jefe spent time in the yucca and made 10. Not really important, or even relevant to the story, but I'm going to leave it in here anyways), Jefe bounced back with a remarkable birdie and a half on the brutally-tough 17th (not only have I not even sniffed a birdie there, I've only hit the green in regulation twice in over 75 tries). After 35 holes, we were right back where we started. Walking up to the 18th tee, Matt was shrewd enough to point out my less-than-stellar match play history on the final hole, not just my mini-choke from the day before but my epic collapse last year with the entire Ballynizzle Cup on the line. But it's a completely different feeling having Jefe actually sending positive voodoo in my direction, and I blasted one down the right side of the fairway. Matt hit his patented high-draw, solid and down the left, really shortening the hole. Jefe and Jimbo found the rough and were effectively out of it. The match now boiled down to Matt and I from less than 170 yards in. I went first and pured a 7-iron, taking it up the open right side of the green and bringing in towards the back-center of the green (dare I say, a fade?). Matt went next and promptly laid the sod over the ball, advancing it about 75 yards total. Two putts later and the improbable comeback was complete. Easy going Matt took his Calcavecchian-choke job in stride, but I know everytime he was forced to refer to us as "Champs" that weekend, a little piece of him died on the inside. Winning wasn't even the best thing about the two-day match, although I have to admit, it was pretty darn sweet. The best part was about half-way through the first match, you could almost see the lightbulb go off in our collective heads. We knew we had stumbled onto something special. "Something tells me we're going to playing this same fourball match twenty years from now," I said to the group as we putted out on the 11th green. And God willing, if we are, I also know what we'll be playing for. Usually pride is more than enough, but a special match such as this one required just a little extra skin in the game. As you probably know, Ballyneal is a walking only course. And Tom Doak did a masterful job with the routing, building an intimate, walking-friendly golf course. The toughest walk on the entire course is the one after the 18th, when you walk about 75-80 yards uphill to get back to the pro shop. It's not a bad walk at all, but it seems about twice as long after your 36th or 54th hole of the day. So in a rare moment of inspiration, I came up with the perfect prize for our match: Losers carry the winners' bags up the hill. So simple. So brilliant. So perfect. Add "Inventor of the Climb at Ballyneal Golf and Hunt Club" to my list of lifetime achievements. Of course, an epic moment such as this just had to be captured for historical purposes. I hope that "The Climb" catches on at Ballyneal to the point that 95 years from now somebody will wonder how that tradition got started. Then maybe this picture will make its way into a special leather-bound, centennial collectors edition, called "Ballyneal: The First 100 Years". Just check out the look of pure disdain on Jimbo's face. Priceless. If there's one thing my ten devoted blog readers can count on, it's the straight dope on the latest and greatest golf courses around the globe. Sure, you might have to chug through some self-loathing and a lot of Jefe-bashing to get to the dope, but it's there. Trust me. 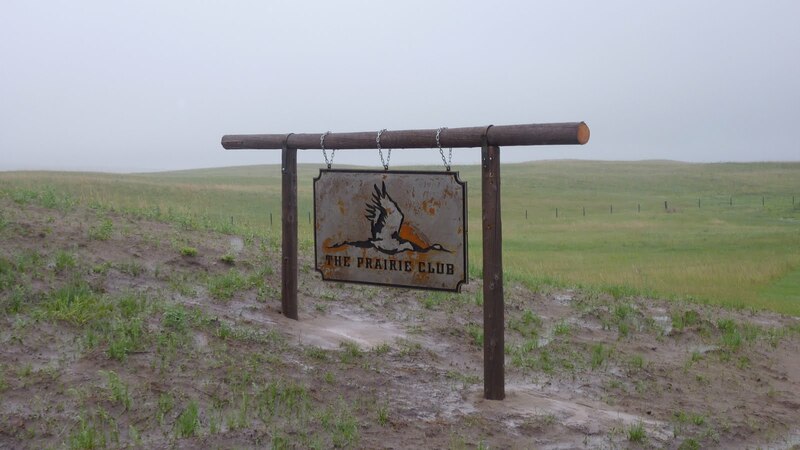 Understandably, I was thrilled to head out to the Prairie Club in June. Not just to play the two regulation courses and 10-hole "Horse" course over a couple of days, but also to provide my loyal following an exclusive review of this de novo golf excursion just two weeks after its grand opening. I went to Valentine, Nebraska and all I got was this lousy half-zip pullover. Ok, that's not exactly true. I actually really like the half-zip pullover (I'm a sucker for them). But that is about all I have to show from our time at the Prairie Club. Sorry Jeff, Jim, Keith, Wyatt, Tim, Matt, Tom, Shane, Rich and Vic (what other blog offers such personalized attention? ), that's all I got for you. Sunday morning was a bit of a wash-out at Ballyneal. About half the crew decided to go out, half never set foot out on the golf course. I don't need to tell you which camp I was in. Jefe, Jimbo and I played in a cold, driving rain. Isn't this June in the high desert? After nine holes, even Jimbo had had enough. "I'm just not having fun out here right now," he admitted, definitely the first time those words were ever uttered out in the Chop Hills. Jefe and I soldiered on to the back nine, trying to make the most of it. 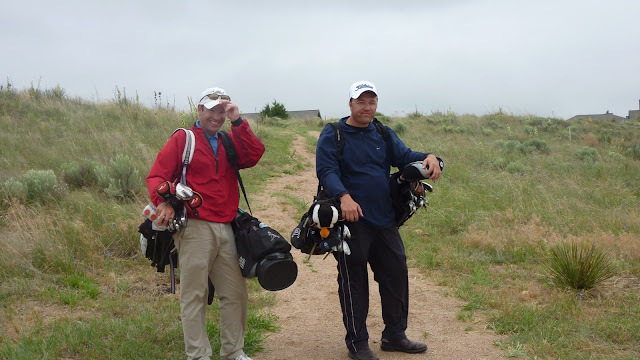 It turned out to be a fun round together, and the weather improved as the day wore on. It actually worked out for the best, as Jimbo was stuck getting the car ready for our departure while Jefe and I chased the nugget around. After getting cleaned up, we were on our way. The Holyoke-to-Valentine leg of the road trip got off to an ominous start. By the time we reached the gas station in Holyoke to fuel up and Coke up (one of my only complaints about Ballyneal…Colorado is Pepsi country), it was pouring. In fact, most of the four-hour trip was like that. The trip to Prairie Club is essentially the same as the drive to Sand Hills, just an hour or so further north. You take the same route to North Platte, Nebraska and head north through the Sand Hills region. You may recall from my Sand Hills report last year that the last leg of the trip is like every golf architecture afficiniado's dream…you drive through these giant sand dunes that are littered with huge, natural blowouts, i.e. potential golf holes just sitting there waiting to be built. Driving down Highway 97 for now the third time, the novelty had worn off but the awe was still there. This is really an incredibly beautiful part of the country, at least as far as we could tell in between wiper blades zipping back and forth. The area near the Prairie Club is even more impressive. The Snake River weaves it way through the Sand Hills and borders the club's property, the rush of water carving a huge canyon through the sand dunes. I never got a close look, but I'd have to guess the canyon is at least 100-150 feet deep, lined by pine trees on either side. Like I said, impressive. 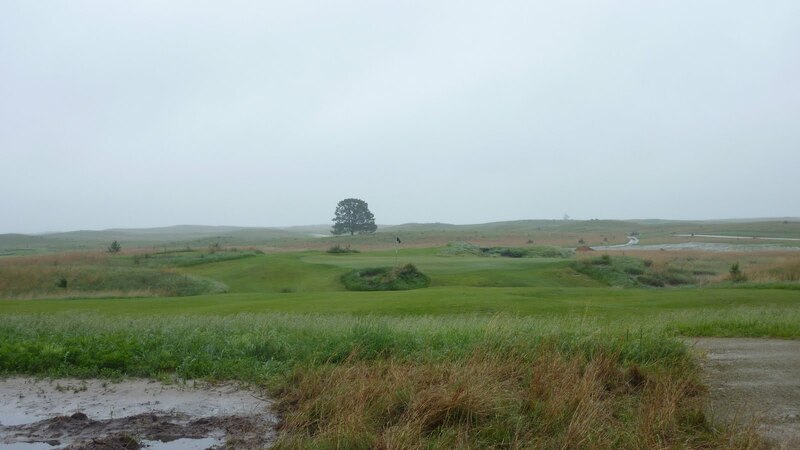 And the courses are located adjacent to the canyon, with the Graham Marsh-designed Pines course weaving around and near the canyon's edge and the Tom Lehman-designed Dunes course going out and back into the open prairie. At least that's what the yardage book says. 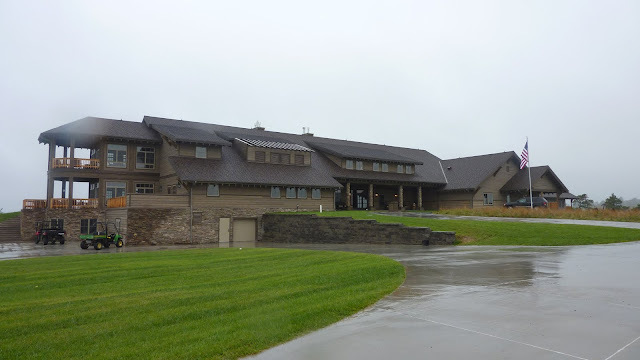 We arrived at Prairie Club's luxurious lodge just in time for a late dinner (good thing too…as Jefe's four-day old bag of trail mix was the only Plan B). We also got the chance to talk to one of the guys in the golf staff, who informed us that the course had been closed that day and was more than likely to be closed the next day as well. Of course, this bit of information would have been helpful, say, four-and-a-half hours earlier, especially considering we called the course to change some rooms around* as we were leaving Holyoke. But I guess they wanted their lodging revenue. Sure enough, we woke up the next morning and the weather was more of the same. Granted, it had rained a bunch, but not once did we consider the possibility that a course built out in the Sand Hills region could have drainage issues that would prevent it from being playable. 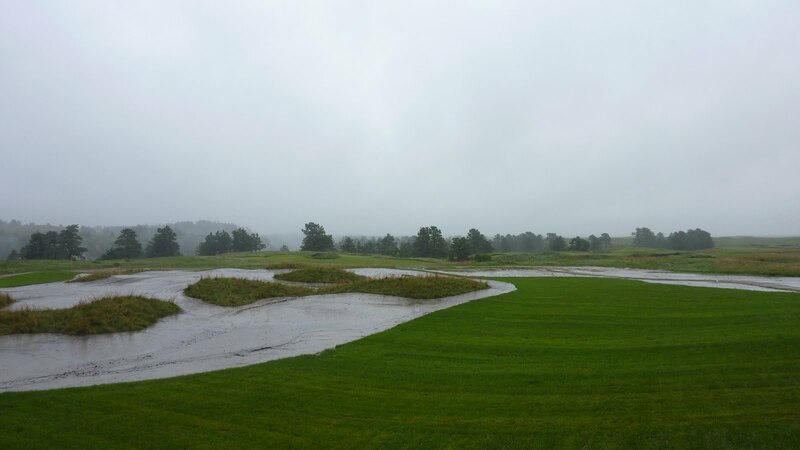 In contrast, a couple of the guys from our weekend group played 54 holes at Sand Hills that same day, and a call down to Dismal River confirmed they were open for play as well. I guess that's the downside risk of trying to play a course right after it opens. Live and learn. After some hemming and hawing, we determined that our best course of action was to make the long drive back to Holyoke. But when your Plan B is two more days at one of the best golf courses built in the last 70 years, I guess you can't really complain too much. By the time we may it back to Ballyneal, the sun was out and the course was already blazing firm and fast. We'll never get that eight hours we spent in the car back, but at least I have this Under Armour pullover as proof that I was there. And these pics…enjoy! I love the golf trip prayer...as I have honestly said my own version of that on more than one occssion! Classic. We share the same fate on this harbinger of doom to the round of golf. My only solace is the fact that I har more pars and birdies on the seventeenth than my personal nemesis Jimmy aka Nellie. Now that is what I call DISDAIN! 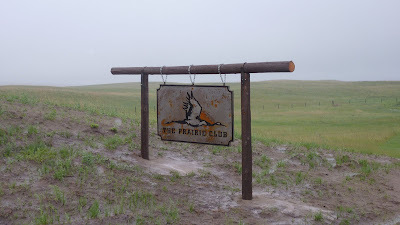 I'm not sure if I'm the Rich mentioned in the Prairie Club post regardless, I'm honored. With Schulte already in with a comment, you know that there are at least two Matts reading your blog. I just wish I could have got you guys out to SH that day but it looks like things turned out just fine in the end. If you haven't already, you definitely need to go play Northern Michigan. True North, Bay Harbor, Harbor Shores, Forest Dunes, Hidden River, and Arcadia Bluffs to name a few. I live in Ohio and go up there every Summer. I've gone up for five summers and have yet to dent my list of courses to play. See you up there!